Late Wednesday night, Michigan landed a major commitment from 2015 running back Mike Weber. 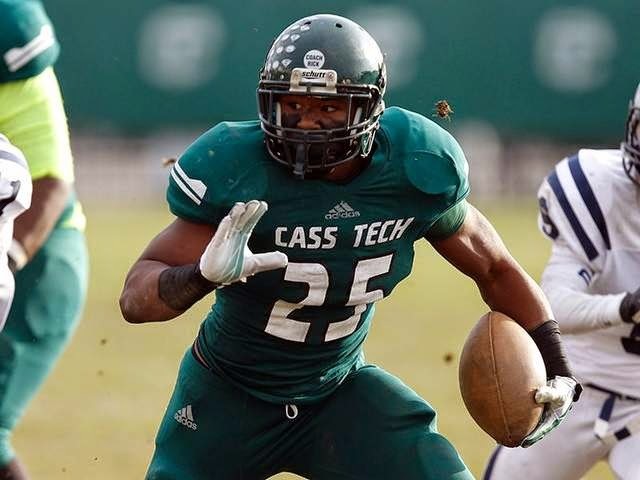 While on an unofficial visit to Ann Arbor with fellow Cass Tech players, Mike Weber had decided he had finally had enough of his recruitment, and told the coaching staff he would like to join Team 136. Mike’s commitment could be the biggest one of the year so far. Michigan absolutely needed to take a running back in 2015, and after Damien Harris left Michigan off his Top 5 list last week, it looked like it was either Weber or bust. Weber, who’s recruitment has been a whirlwind so far, had seen Michigan fall out of his Top 5, to only come steaming back to land the four star prospect. With Brady Hoke and company trying to bring Michigan back to the “ground and pound” offense, Mike fits this bill perfectly. He’s a three down back, who could bring the north-south running style back to the Wolverines. He possesses excellent vision, as most of his big yard gains come from finding a hole on the defensive line and bursting through it. Although he doesn't have take your breath away speed, he does have enough speed to get away from defenders. One major aspect of his game that I'm a fan of is that he doesn't shy away from contact. Mike has no problem putting his head down and running over the defender in front of him if he’s in the way. He does an excellent job at keeping his legs moving, making it much harder for defenders to wrap him up in a tackle. A much underrated part of his game is his ability to catch the ball out of the backfield. Weber does a good job of catching the ball with both hands, cradling it to his body, then keeps his head on a swivel to find extra yardage. While speaking with Josh Newkirk, Weber explained why he ultimately chose to dawn the Maize and Blue. Due to depth and the talent Mike possesses, I don’t foresee Mike getting a redshirt his first year on campus. Derrick Green, Drake Johnson, Deveon Smith and Ty Isaac will all be upperclassmen once Weber arrives on campus, leaving Mike with an abundance of fellow running backs he can learn from. Brady Hoke has done an excellent job so far recruiting for 2015. Michigan now boasts the top 3 in-state players according to Rivals.com. Mike becomes the 10th member of the 2015 recruiting class, joining; Jon Runyan Jr., Alex Malzone, Darrin Kirkland Jr., Tyree Kinnel, Garrett Taylor, Grant Newsome, Andrew David, Chris Clark, and Brian Cole. Mike will also be taking part in the U.S All American game, this upcoming January. With only around 4-6 scholarship spots left for 2015, Michigan will look to take two defensive ends, another linebacker, one more cornerback, and possibly one more receiver to round out their recruiting class.